For quantitative determination of peroxidase activity. PEROXIDASES (EC number 1.11.1.x) catalyze the following oxidation-reduction reactions: ROOR’ + electron donor (2 e-) + 2H+ → ROH + R’OH. For many peroxidases the optimal substrate is hydrogen peroxide (H2O2), but others are more active with organic hydroperoxides such as lipid peroxides. In the cell, peroxidases destroy toxic hydroxide radicals that are formed as byproducts during aerobic respiration. The peroxidases represent a large family of enzymes that are found in animals (e.g. myeloperoxidase-like enzymes), plant, fungi and bacteria (cytochrome-c peroxidase like enzymes such a horseradish peroxidase). Simple, direct and automation-ready procedures for determining peroxidase activity find wide applications. BioAssay Systems’ peroxidase assay uses H2O2 and an electron donor dye that forms a pink color during the peroxidase reaction. The optical density (570nm) or fluorescence intensity (λex/em = 530/590nm) is a direct measure of the enzyme activity. Applications For quantitative determination of peroxidase activity. 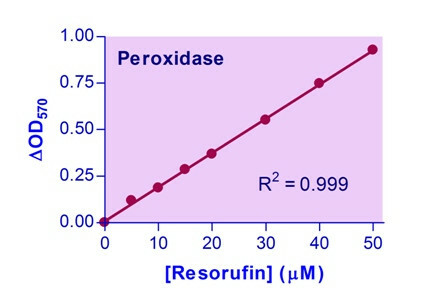 References Assay: Peroxidase in rat serum (Pubmed).